Good Morning! Actually, when this auto-posts, I hope I am still sleeping. Or at least sitting at my craft table, sipping on a steaming cup of coffee and coloring images. We're revisiting a sketch over at Tuesday Morning Sketches and we have a fabulous sponsor. Print Candee is joining us - yippee!! My card features some really great digi paper from Print Candee. Isn't that a great pattern on that paper! This is a fun color combo, too. It just sort of evolved itself. 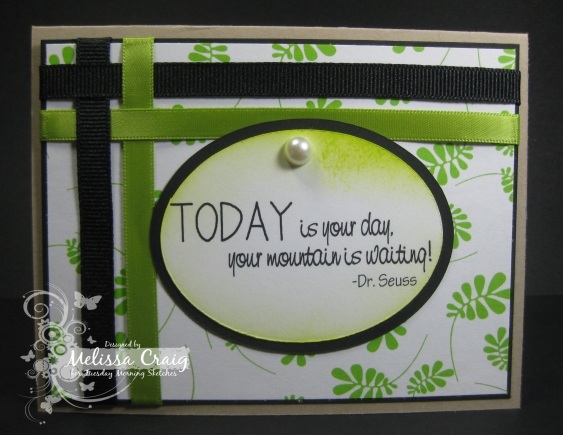 Lime green, black and Kraft - I love it. Come on over to the TMS blog and join us this week. It'll be fun.... promise! Very cute...I do love that color combo...the lime is so fresh! Great quote too! Spectacular color combo, very bold and fresh. The Dr. Seuss quote...so true. Love the single pearl on the focal point and the distressed edges. Fun quote, beautiful DP and ribbons make for an all-around great card, Melissa! One of my favorite quotes!! Love the colors - it's great when everything comes together so perfectly. Beautiful card Melissa! I love the color combo. So pretty! Very pretty card!! And great sentiment, too!! Very pretty Melissa. Love the color combo and this quote.